Available here in the Garage Sale in Red with Black Highlight and with GT500 badging, kit is packaged with one (1) left and one (1) right side graphic. Graphic has a Gloss surface. Designed to be placed approximately 1" (25.40mm) below the distinct body line as shown, slight trimming is required at rear door jamb and rear wheelwell opening of '10-Current Mustang models. 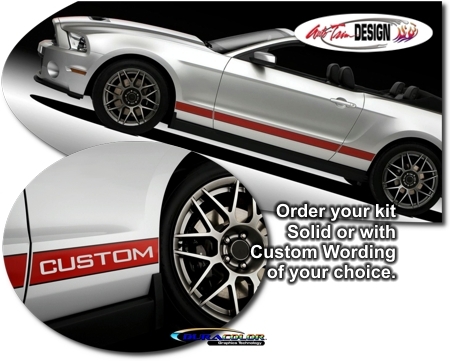 While graphic is fit for '10-Current Ford Mustang Front Fender, Door and Rear Quarter areas, with slight trimming kit may work well with Mustangs below the 2010 model year.